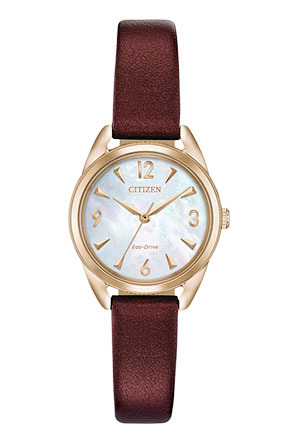 A nod to femininity with the slim LTR from CITIZEN®'s DRIVE collection, the perfect compliment to your wrist. Shown here in a rose gold-tone stainless steel case with a merlot red vegan leather strap, and a Mother-of-Pearl dial. Featuring our Eco-Drive technology – powered by light, any light. Never needs a battery.